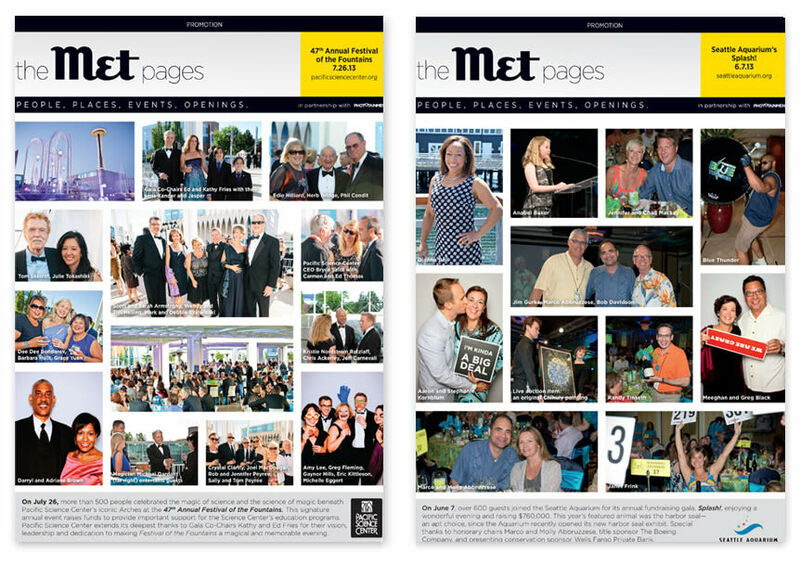 Since debuting in March 2006, Seattle Met is the most valuable and researched source of local, lifestyle content delivered in any way consumers deem valuable to their lives. Seattle Met readers enjoy a sophisticated life. They define themselves by their life experiences, their accomplishments, and their interests. Whether they’re making choices related to entertainment, dining, spas/fitness, shopping, travel, museums, theater, the outdoors, or local wine tastings, Seattle Met is their principal guide. Seattle Met is available at more than 900 newsstands, specialty grocery stores, and local retailers throughout metropolitan Seattle, nearly all of which give the magazine prominent checkout aisle placement. Retailers include: QFC, Whole Foods, Fred Meyer, Safeway, Albertson’s, Metropolitan Market, Borders, and Barnes & Noble, as well as key airport locations and many more. In addition to the magazine’s rapidly growing paid subscriber base, Seattle Met has an exclusive distribution program with 47 prominent hotels reaching 13,175 total rooms. Seattle Met also has a large waiting room distribution program with hospitals, and physicians’ and attorneys’ offices. Who is the Seattle Met reader? 41 Median Age, Print Readers. 34 Median Age, Digital Readers. 58% Are Executive, Professional, or Managerial. 78% Own their own home. 79% Do NOT have a newspaper delivered to their home/office. 71% Plan to take 3+ trips in the next year. 60% Eat at full-service restaurants 5 times per month, 29% up to 10 times per month. 60% Frequently buy products and services advertised in Seattle Met. For full details on our editorial calendar and advertising rates, please contact our sales staff at 206-454-3023 or adinfo@seattlemet.com. More than a magazine, Seattle Met is dedicated to creating an environment where our community can come together and enjoy memorable, one-of-a-kind experiences. In bringing the city the latest eats, drinks, entertainment, style, and ideas, we also structure our events so many of them benefit a local charity and promote community involvement and goodwill. From our existing signature events to custom projects, we are able to reach a diverse, active and affluent audience. For an upcoming events schedule, sponsorship opportunities, or to hire us to produce an event tailored to you, please contact, Polly Zel at pzel@sagacitymedia.com. Click here to complete our 2018 media sponsorship application. If you are a new or existing advertiser, please download our Digital Requirements for Print and Digital Requirements for online ads. If you have any questions about the Digital Requirements or need further assistance, please contact our Production Manager, Andi Blija, at 206-454-3088. The city's preeminent who's who in pictures and words, highlighting the remarkable people and events that make our city so vibrant, exciting, and generous.